SLY | What Does SLY Mean? SLY means "Still Love You". SLY can be pronounced as an acronym (i.e., spoken like the word sly) or an abbreviation (i.e., Ess Ell Why). SLY is commonly used after wronging someone or having been wronged by someone to let them know that you still love them. Of note, although rarer, SLY can also mean "She Loves You" or "Someone Loves You". As an adjective, the word SLY (i.e., when not used as an abbreviation) means cunning, sneaky, or devious. SLY means someone still loves you. Richard: "Hey, baby, are you being followed? Because I've been seeing people behind your back." Elaine: You're funny SLY though. Mark: I'm back late tonight. Sharon: Okay, SLY even when you're out on the town. 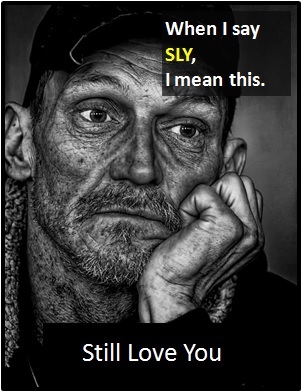 SLY is typically used as a declarative sentence (i.e., a statement) with the meaning "I still love you."